While large-scale climate models (GCMs) are in principle the most appropriate tools for predicting climate changes, at present little confidence can be placed in the details of their projections. Use of tools such as crop simulation models for investigation of potential impacts of climatic change requires daily data pertaining to small spatial scales, not the monthly-averaged and large-scale information typically available from the GCMs. A method is presented to adapt stochastic weather generation models, describing daily weather variations in the present-day climate at particular locations, to generate synthetic daily time series consistent with assumed future climates. 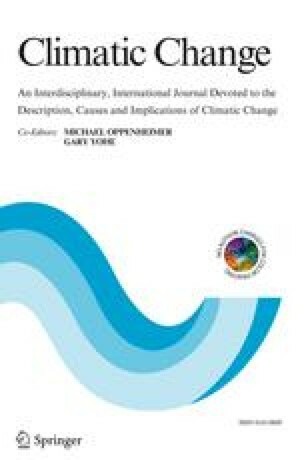 These assumed climates are specified in terms of the commonly available monthly means and variances of temperature and precipitation, including time-dependent (so-called ‘transient’) climate changes. Unlike the usual practice of applying assumed changes in mean values to historically observed data, simulation of meteorological time series also exhibiting changes in variability is possible. Considerable freedom in climate change ‘scenario’ construction is allowed. The results are suitable for investigating agricultural and other impacts of a variety of hypothetical climate changes specified in terms of monthly-averaged statistics. 1.Department of Soil, Crop and Atmospheric SciencesCornell UniversityIthacaU.S.A.